Currently we are eagerly waiting for the upcoming Xiaomi Mi 5s. However, it seems like Xiaomi may also unveil the powerful Mi Note 2 in different variants. While we have been hearing rumours about two variants of the upcoming Xiaomi Mi Note 2, the company may also be working on yet another Mi Note 2 Pro variant. A leaked screenshot of the About Phone page of the alleged handset clearly highlights the name Mi Note 2 Pro as an upcoming flagship offering from Xiaomi. 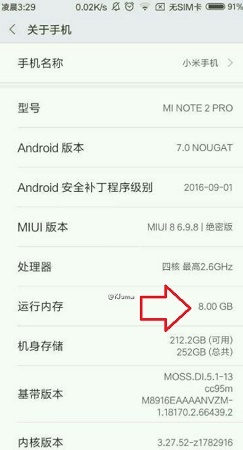 The leaked screenshot also reveals that the alleged Mi Note 2 Pro has a massive 8 GB of RAM on-board. The smartphone is powered by a 2.6 GHz quad core processor which we could assume to be the Snapdragon 821. Interestingly, the handset runs on the latest Android Nougat version, which makes us feel that we might still have to wait a little longer to see the handset.